The documents posted at the close of the recent Primates' Meeting in Dublin tell the story. The takeover of the Instruments of Communion by ECUSA, aided and abetted by the Archbishop of Canterbury, is now complete. Anything of substance was carefully avoided at Lambeth 2008; the proposed Covenant itself was derailed at ACC-14 in Jamaica, and then carefully defanged by the newly reorganized Standing Committee; and now the Primates' Meeting has let itself descend into irrelevance -- with the primates of the churches having most of the Anglican Communion's membership absenting themselves, and refusing to prop up the pretense of normalcy any longer. The response of The Episcopal Church to the requests made at Dromantine has not persuaded this meeting that we are yet in a position to recognise that The Episcopal Church has mended its broken relationships. There is not a word in any of the statements released from Dublin today about the commitment that ECUSA's House of Bishops was supposed to make, and which bishops such as +Bruno, +Shaw and the Presiding Bishop herself have so deliberately flouted ever since -- along with the General Convention of the whole Church. It is abundantly clear, based on the statements from Dublin, that the Primates who gathered there are not going to follow through with their commitments at Dromantine and Dar es Salaam. So ECUSA has prevailed, and will have its way. So the circle is now complete. The Dublin primates have agreed to work through the Standing Committee, which will "help to shape" their meetings in the future, and build bridges to unspecified "regions" in the meantime. Doubtless the Standing Committee will have its work cut out for it, as they say. The Anglican Communion Office promises to tell us who was elected to membership on the Standing Committee just as soon as all the non-attending primates have been notified first. This is one Anglican who will not be holding his breath. July 18, 2010: Sarah Palin, addressing supporters of the proposed Ground Zero mosque, either accidentally or on purpose, coins the word "refudiate", blending the sense of "refute" (show to be erroneous) with "repudiate" (disown, reject). Result: within 24 hours, Google registers 54,000 hits with that neologism, and some 218 news articles -- the great majority of them super-critical, and claiming to show Palin's ignorance of the English language. January 5, 2011: Cornel West, the Class of 1943 University Professor of at Princeton University, is featured in an audio excerpt on the Rush Limbaugh program as coining the word "surcame", thereby combining the sense of "succumb" (modified in urban slang to "surcome") with the past tense of "overcome" -- i.e., "overcame". Result: within 24 hours, Google News registers only 2 (non-duplicated) hits -- while in the same 24-hour period, Google registers 29,000 more hits for "refudiate", still mostly critical of Palin. In addressing the House, Rep. Jackson coins the word "didacted" in referring to such no-longer-operative clauses, based on a mixing of "redacted" (edited, blacked out) with who knows what. (A "didact" is a person who is "didactic", i.e., designed or intended to teach or moralize, and so "didacted" would literally mean "taught or preached for instruction or entertainment".) Result: Google registers only four hits with that word in the 24 hours following its coinage -- the majority of which uncritically repeat it, with no discussion of the neologism it represents. And in the same 24-hour period, Google logs yet another 13,200 hits on "refudiate". Objectivity, thy name is not the current media. I rest my case. Attorneys for Bishop Jack L. Iker of Fort Worth have now filed a request with Tarrant County Judge John Chupp for a stay of the orders he issued last Friday, January 21. A hearing on the request is scheduled for next Tuesday, February 1st, at 10:00 a.m. The stay request is based on a number of objections to the orders, described in the papers just filed, which may be downloaded from the link just given. • The Plaintiffs deposed 57 ministers of Defendant congregations in 2010 (see attachment A), and declared that they "shall be deprived of the right to exercise the gifts and spiritual authority of God's word and sacraments." If parishes are immediately transferred to the Plaintiffs, these pastors may not be allowed to minister at these churches pending appeal. Due to the number, it is unclear how TEC can replace them all. • Parishioners loyal to Bishop Iker may do what parishioners loyal to TEC did in 2008: leave. The Defendant parishes have about 5,600 people in average Sunday attendance; those attending Plaintiff congregations number only a fraction of that amount. The effects of the Court's interim orders on church buildings, budgets, and bank notes could be catastrophic. • Even if they don't leave, parishioners may stop giving because they do not want to place offerings in TEC's hands. This again could have catastrophic effects on scores of pastors, staff, and families who depend on these gifts for food, clothing, and shelter. How can such hardships be undone if the appellate courts decide the summary judgment orders here were a mistake? • In many churches, there is no one loyal to TEC. For example, in their First Amended Original Plea in Intervention filed on November 2010, the Plaintiffs listed the names of loyal "representatives" for 12 churches, but listed 34 additional churches as to which nobody appears to have been willing to be a loyal representative for TEC. Who will occupy these churches? What will happen to their condition if they are abandoned? At least 13 families affiliated with the Defendants live in homes owned by the Corporation. As these ministers and staff are no longer recognized by TEC, the Court's orders appear to allow the Plaintiffs to evict them. • Almost 200 employees, spouses, and children of ministers and staff are covered by a group insurance policy. If a significant number of these are no longer employed by a local church, their insurance and perhaps that of the entire group may lapse. • The property here includes schools where classes are ongoing. Surrendering these schools immediately is likely to cause losses of both students and teachers, losses that may be unrecoverable if these orders are reversed after these people are enrolled or employed elsewhere. • The bishops and staff of both sides must move out of their current administrative offices into new ones, a move that will have to be repeated if the summary judgment order~ are reversed. • Defendants will have to relinquish personal property owned by the Diocese or Corporation, such as autos, cell phones, office equipment and supplies, computers, and the like without any promise by the Plaintiffs to pay future rentals or invoices related to them, and which can be replaced only by incurring substantial extra expenses. • Vendors and creditors have relied on the Corporation's books and records regarding which directors are authorized to promise repayment. By unsettling who that might be, the Court's orders will make it difficult for either side to secure credit until all appeals are concluded and it is finally decided who the authorized directors are. This is why deciding that a diocese cannot leave the Church is not the same as deciding that a parish may not leave a diocese. Dioceses are sizable entities in their own right, with literally hundreds and hundreds of clergy and laity dependent on their continuing function and existence. The relocation of a parish, while painful and inconvenient, is on an entirely different scale than the relocation of an entire diocese. Moreover, the Dennis Canon does not apply to the property of Dioceses. The outcome of the parish cases cited by ECUSA's attorneys turned largely on the application of that Canon's language as "codifying" an existing trust relationship between a parish and its diocese. There is no counterpart "trust relationship" between an individual member diocese of an unincorporated association and all of the assembled members as a group. The entire reasoning of ECUSA, as adopted holus bolus by Judge Chupp without any discussion or input of his own, is defective in treating dioceses as the legal equivalent of individual parishes. One of the reasons I find charges of "theft" and "stealing" so inappropriate for these unhappy situations is that they are not based on any rule or canon which existed before the dispute arose. Those in charge of ECUSA are simply making up their legal theories as they go along, and changing the rules at whim, to suit their personal, and very un-Christian, aims. Thirty-four churches must be turned over so they can become vacant and sold for other uses? And many more emptied of their current large congregations so just a few people can return to them? All because a judge is misled about the difference between a parish and a diocese? There is no Christian or moral ground here -- let alone a legal one -- on which Bishop Ohl may rightfully stand. But watch him direct his attorneys to oppose Bishop Iker's request for a stay. We saw in this previous post how banks are legally privileged to create new money out of thin air, as long as they keep on hand ten percent of their outstanding loans as legally defined reserves (cash on hand, stockholders' equity, and credits with the Federal Reserve). There is one privileged bank, however, which is subject to no reserve requirements, and consequently has the power to create new money without limit. That bank is the Federal Reserve Bank, first established by Congress and Woodrow Wilson in 1913. Obviously, in any given nation, there has to be something defined as money, which people accept as legal tender in settling debts and obligations. In a republic, it is the duly elected and representative government which has the power to define what is money for that country. Having the power to define what money is, however, does not necessarily include the power to create it at will. In a country such as the United States was until the Civil War, for example, the nation's money was coined gold and silver, together with private notes issued by trusted banks. As we saw in the earlier post, allowing a bank to issue paper notes allows it to create "money" out of thin air. The reserve requirements were imposed to keep such a temptation from going unchecked. When a bank in a democratic republic is allowed to create money without limit, then to keep the people's control over their government, there has to be some kind of check on that bank's power. If exercised independently of the peoples' will, then there is no longer a resonance with that will, and the money system is in the hands of others, no matter how wise or well-intentioned they may be. At the same time, the people themselves do not have the power to create money without limit, either, since it would lead to the destruction of the republic by other than democratic means. This is the great problem of democratic governments, as first stated by Aristotle: left to their own devices, the electorate will end up voting themselves all the collective wealth. The tendency of pure democracy is to devolve into socialism, and then communism, and finally despotism. If money is created without limit, runaway inflation is the consequence. Goods are hoarded, and become scarce, because no one knows each morning what money will still purchase by the time evening comes. 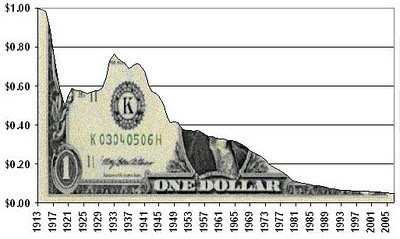 The United States has tried to solve this ancient problem since 1913 by giving free reign to the Fed to create money, and by imposing on it two overall goals or purposes to guide its operations: (1) to prevent inflation; and (2) to secure full employment. The problem is that these two goals are at odds with each other. While there is money available for investment and expansion, new supplies of labor can gradually be absorbed and accommodated. But if everyone were fully employed and earning money at every available job, there would be too much money chasing too few goods, and inflation would result. In fact, the state of "full employment" has never been reached: there will always be some lag between jobs available and people looking for work, with just the skills required to fill those jobs. In the meantime, however, the Fed has been given the power to create money without limit. It is only in the last four years or so that it has exercised this power to a degree never before seen. It used to be the practice of the Fed, when it wanted to expand the money supply, to purchase existing (already-issued) Treasury securities from selected bond dealers. It would write them checks on its bottomless account in payment, which the dealers could deposit only in their own bank accounts (since the Fed accepts accounts only with member banks). Those banks would happily send the checks back to the Fed, which credited their reserves. And with the increased reserves, the banks could now create more money which they could lend out at interest. Everyone was happy. Lately, however, the Fed has been writing its checks to purchase from the banks assets that no one else will buy -- securities for mortgages in default, for example. These are the so-called "toxic assets" which were worthless on their balance sheets, and which deflated their reserves. The idea seems to be that if anyone can wait long enough for those assets to turn around, it will be the Fed. Meanwhile, they are out of the banks' hands, and they can use the Fed's payments to them to help meet their reserve requirements once again. Notice that I have not talked about the U.S. Treasury's purchase of toxic assets through the TARP program -- only the "off-balance-sheet" activities of the Fed. (Being an independent institution not owned by the federal government, the Fed's books are separate from those of the government.) But the Treasury has been right in there, too, bailing out banks, and feeding money into "stimulus" programs. The difference is that when the Treasury does it, it does it with borrowed money. And the end result, because net borrowing stays the same, is zero stimulus to the economy, but more interest now owed by the government. And thus we come to the craziest feature of the current system. The government cannot print money; only the Fed can do that. Both the Fed and its member banks, therefore, can do what the government cannot do -- and they get to earn interest on the money they create. The government, on the other hand, borrows that money from them, and repays it to the banks with interest. Normally, it does so with revenues from taxes, customs duties and the like. But in deficit years, when the government's expenses outrun its income, the government will borrow new money to repay old debt. The result, if not stopped, is an ever-increasing cycle of debt, driven by the power of compound interest. This is probably far enough for now. I realize that some of this can be hard to follow, and certainly some of it is even harder to believe. Why do the banks get to create all the money at zero cost, and then make money off the rest of us? What is so privileged about banks? And how can the cycle of compound interest ever stop? (The more money that is created and lent, the more additional money has to be found or earned to pay the accumulating interest.) We will begin looking into those issues starting with the next post in this series. Last August 30, Provisional Bishop Jerry A. Lamb and his plaintiff diocese filed a separate lawsuit against St. John's Anglican Church, in Stockton. (Here is a copy of the complaint which you can view or download.) This was just one of nine such lawsuits brought individually against each of the incorporated parishes which had left the Episcopal Church (USA) in December 2007 along with their Diocese, which had voted at its convention that month to adopt the final changes to its governing documents to align itself with the Anglican Province of the Southern Cone. The object of each of these complaints is to have the court order the parish corporation to surrender all of its real and personal property -- building, grounds, bank accounts, hymnals and prayer books -- to Bishop Lamb's kindly management and control, which would in nearly all cases result in everything's immediately being sold, because there are not enough persons "remaining Episcopalian" in each of these parishes to pay for their upkeep, let alone for a rector's salary and benefits. Thus their main objective is to punish, and to cause the defendants to waste even more money on litigation. The thirteen individual defendants sued in Stockton, however, decided not to answer Bishop Lamb's complaint, but to file what is called in California a "demurrer" to it. A demurrer, in effect, says to the court: "So what if everything the plaintiff alleges in his complaint were true? Even if you regarded everything true as pled, the plaintiff still has not stated a claim on which you can grant any relief." The vestry and rector of St. John's (Father Lee Nelson) thus challenged the sufficiency of Bishop Lamb's complaint against them, individually. They argued that since it was the parish corporation that owned legal title to all the property, there was no point in suing them for the property as well. They were legally the officers and directors of the parish corporation, to be sure; but in that capacity, they do not have any right to own or possess the corporate assets. And last Thursday, in Stockton, Superior Court Judge Lesley D. Holland agreed with the defendants. He rejected Bishop Lamb's arguments that the individuals needed to be sued so that they could be ordered to vacate the property. He pointed out that Bishop Lamb had already sued the corporation itself, and that was sufficient in order to obtain the relief that he was requesting. There was no need to sue the corporate officers and directors as well. Here is a link to the minute order entered by the court. You will see that at first the judge made no tentative ruling on the demurrer, but ordered both sides to appear and present oral argument. Then, after hearing the arguments, the court ruled that the defendants' demurrer to the complaint "is sustained without leave to amend." That is magic language a court uses when it wishes to tell a plaintiff not only that he has failed to state a claim for relief, but that there are no possible amendments he could make to his complaint which would remedy the defect, either. So as far as Judge Holland is concerned, the case against Father Nelson and his vestry members is over. Second, any such appeal will likely mean a further postponement in the object of 815's San Joaquin strategy: to run up the defendants' litigation costs. Appeals take at least eighteen months to two years to resolve, and it is the parties appealing the judgment who will incur the bulk of the costs on appeal. But most of the time, once the briefs are all filed, there is nothing to do but wait for the court to get around to scheduling oral argument, which typically involves a delay of twelve to eighteen months from the time the last brief is on file. But third (and perhaps best of all), this ruling could cause 815's strategy of running up the defendants' costs by suing them all individually to backfire. For if Bishop Lamb does not appeal Judge Holland's ruling and it becomes final (or if he does appeal, but loses), then each of the thirteen defendants will be entitled to recover their court costs from Bishop Lamb and his group. And that will include the $4,615 they had to pay to the court to file their successful demurrer. If that scenario repeats itself eight more times in the other pending lawsuits, Bishop Lamb's San Joaquin group might have to get a bigger line of credit from the masterminds at 815 Second Avenue. The judge did not issue a decision of his own, but simply signed the pro forma orders submitted by ECUSA and the local Gulick parties. He made a few deletions in the former, to make it clear that he was deciding the case by deference to the "hierarchy" of the Episcopal Church (USA), and not on neutral principles of law. Indeed, he staked his all on a bet that the Texas higher courts would not follow the latter approach, since he struck out the proposed paragraph that would have said he would reach the same result under "neutral principles" analysis. Thus if the Court of Appeal rules that he should have applied neutral principles, he will have to start all over again. Also, no findings of fact, or sanctions issued, for the unprofessional conduct with which Bishop Iker charged his former counsel. So that will be more grist for the appeal. Ho, hum -- this decision represents just another notch in the belt, another appeal, and more dollars to be spent because the lower courts are consistently proving themselves unequal to the task of analyzing all the points of real conflict and dispute -- which in this case should have required a trial, with appropriate findings of fact made after a weighing of all the evidence. Fort Worth deserved better, but we shall have to wait. After the previous post, the conceptual difference should now be clear between money coined or redeemable in silver or gold, and money redeemable only in more of the same, i.e., paper. The former is a thing of the past: we are never likely to see it return in our lifetimes. So just forget about it. Our desire for convenient money has trumped our need for concrete money. "We all accept paper dollars now." Suppose you have a small retail business, in which you have accumulated a bunch of paper currency amounting to nearly $350.00. You don't want to keep that much cash lying around, and so you gather $250 of it to deposit in your bank. You make out a deposit slip with your account number on it, and you hand it, together with the cash, to the teller, who stamps your deposit slip, and gives you a receipt. What have you (and the bank) accomplished by these actions? You have traded the Fed's paper promises to pay (in more paper) for the bank's promise to pay you, at your request, all or any part of the $250, again in paper dollars. In fact, if your account pays interest, then you have lent the Fed's paper promises to the bank, in exchange for its promise to pay you regular interest at a specified rate, plus the principal on demand. The bank now has $250 more in cash, which it puts in its vault, where it eventually will become commingled with all of the other currency in its possession. It keeps this currency on hand to meet the day-to-day cash withdrawal needs of its depositors. On average, those needs are far less than the total amount of deposits in the bank. The bank's promise to pay you back your money is now a liability on the bank's books, expressed in the credit it gives to your account in the amount of $250.00. That credit, however, is simply an electronic transaction, accomplished with a few keystrokes. Although banks will rent you a safety deposit box in which to store your valuables, which remain segregated there and hence your own, the dollars which you deposit vanish immediately into the bank's holdings of currency, and are no longer "yours." You have no legal right to get back the same physical Federal reserve notes you handed over to the bank (unless you put them into your safety deposit box). Electronic money differs from paper money in the ease with which it can be transferred instantly from one place to another -- the bank "wires" the money to another bank, for instance. Trillions of dollars are moved around the world every day in this manner, and no physical cash changes hands, but only electronic debits and credits. The sheer convenience of electronic money has led to its dominance in our banking system. Make no mistake, however: electronic promises to pay are twice removed from the original source of the promise to pay. They represent a bank's promise to credit you with a certain amount of money, which it will satisfy upon your request to be given paper currency in exchange -- which then leaves you free of the bank, and with only the Fed's promise to redeem your currency in denominations of like kind. But if a bank only took in deposits, which create liabilities on its books, then how would it acquire any assets to offset those liabilities? Well, if it kept all the depositors' cash in its vault, then that amount of cash would offset the liabilities owed to the depositors. But then the bank could never make any money -- with which to pay you interest on your deposit, for example. As we all should know by now, no bank keeps 100% of its depositors' total deposits around in cash in its vaults. It loans out money to borrowers, and charges them interest, so that they have to pay back to the bank considerably more than what they borrowed (on a long-term loan). The extra which the bank thus earns allows it to pay (a lower rate of) interest to its depositors, pay its expenses, and earn a net profit. The reason why a bank's cash on hand never equals the total deposits on its books is quite simple to understand, once you realize how a bank operates. For a bank's deposits do not consist just of money that has been brought in to the bank by people with currency to deposit. Every time a bank makes a loan to a borrower, such as to purchase a car, or a house, the bank simply creates the loan amount electronically in the borrower's account, with no actual cash ever changing hands. When the borrower writes a check on his account to pay for the car, for instance, the seller deposits that check with his bank, which then electronically exchanges debits and credits with all the other banks, through the auspices provided by the Federal Reserve System. The same thing happens with paper checks which are deposited in the bank -- an electronic credit is generated to the account in the amount of the check, and no cash ever changes hands. Thus, the actual amount of money circulating in the economy at any one time is far greater than just the total of all currency and coins outstanding. But where does all this electronic money come from in the first place? Are there no limits to the amounts that banks can create electronically by lending? There are: the limits are both practical (only so many people want to borrow, and are able to borrow, at any given time), and legal: in the United States, most banks must keep at least ten percent of their outstanding loans in the form of "reserves", which are simply cash on hand, or capital invested, or deposits (electronic credits) with the regional Federal Reserve bank. This means that for every $1000 it has in reserves, a bank may lend out an additional $9000 to borrowers. That $9000, as we have seen, comes from nowhere. It is created in a few keystrokes in the bank's computer, and credited to the borrower's account. The money is not only not the bank's own (i.e., not what it has in its vault), but it also comes at zero cost to the bank. It does not have to borrow it from any other bank, and so it does not have to pay interest to anyone on it. But it gets to collect interest on the $9000 from those who borrow it. This is the dirty little secret of our present banking system. The cost of their "money" is zero to counterfeiters, as well (other than the trivial costs of paper, ink and design) -- but they are put in jail for circulating it within our system. Banks, however, by law are sanctioned to create money electronically, up to the limit dictated by their reserves, and to put it freely into circulation so they can earn interest on it. Money thus created electronically can also be destroyed electronically. How? Suppose you write your bank a check on your checking account to pay an installment of principal and interest due on your car loan. The bank keeps the interest portion of the payment, and credits it to earnings. But the principal amount of your payment reduces the total you have borrowed, and to that extent the bank's loans outstanding have gone down. That amount by which it goes down will never be recreated -- bank loans are made to be paid off in the end. The only way the bank can keep creating new money to replace what is paid back is by making new loans, or by increasing its reserves. This has been only a surface overview of money and banking -- for a full treatment, I recommend Murray Rothbard's book, The Mystery of Banking, which is available free as a (1.7 MB) .pdf download from this link. It is very clear and succinct, and explains the subject fully. Now with this and the previous two posts as background, we will finally be ready to look next at how our money system actually operates under the Federal Reserve Act passed by Congress in 1913. 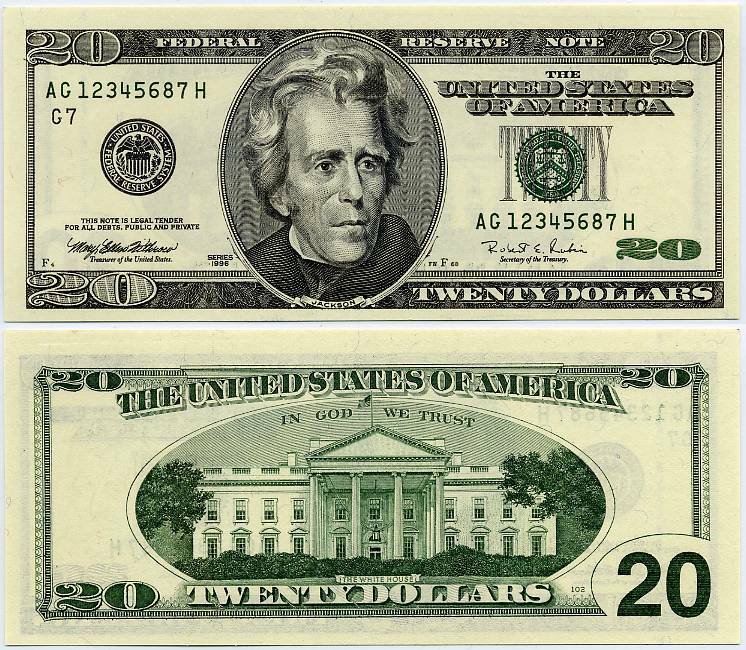 There was a reason that Andrew Jackson refused to renew the charter of the Second National Bank of the U.S. in 1836, and we will begin to see why, after the next post in this series. In the previous post, I called attention to the alarming rate at which the Federal government is "creating" dollars. But what does that mean? Exactly how does the government create new dollars? The mechanics of the current system are well-documented, and are not an arcane secret. But we first have to distinguish carefully between actual paper dollars which you put in your wallet, and the intangible, electronic dollars in bank accounts. The paper dollars with which we are all familiar are printed by the United States Bureau of Engraving and Printing -- separate from the United States Mint, which (until the Civil War) produced only gold and silver coins. The Constitution gives Congress the power to "coin" money. In 1789, its drafters had vividly in mind the poor reputation of the paper "Continentals" printed to finance the Revolutionary War when England had forbidden the Colonies to create their own money, and tried to cut off the supply of pounds sterling. Congress responded by printing the paper currency, and printed too much at once, with the result that it immediately depreciated. This damage to its image was exacerbated by the British, who (according to Benjamin Franklin) skillfully counterfeited the bills in huge quantities in New York, in an attempt to bring down the Revolution. That attempt failed, and the Continentals, even though greatly depreciated, were essential to the new republic's survival, and eventual victory in the War. The aftermath of the counterfeiting took its real toll after the War was over in 1783, and individuals tried to profit from the huge quantities of look-alike currency that Britain had introduced into the New England colonial economy. Salmon P. Chase, who as Secretary of the Treasury under President Abraham Lincoln, had overseen the issuance and distribution of paper "demand notes" to finance the Union's cause (called "greenbacks" because of the color printed on their reverse side, and bearing his picture on the obverse! ), joined (after Lincoln had elevated him to the Supreme Court) a majority which initially ruled that the authorization of the greenbacks had been unconstitutional (!). That 4-3 decision was itself overturned just a year later in the Legal Tender Cases, by a vote of 5-4, after President Grant had appointed two more justices to the Court, pursuant to an act of Congress which had increased the number of justices from seven to nine. In that manner, the verb "to coin" as used in the Constitution was held to subsume, when it came to money, the verb "to print." Eventually, nearly all the greenbacks ($250 million worth) issued to finance the Union during the Civil War were exchanged for gold or silver coin, and so (contrary again to the popular understanding), our first national venture into paper money did not turn out badly. (Any greenbacks which remain outstanding are still valid legal tender today, though they are worth far more unredeemed.) Paper money on a national scale was not introduced again until after Congress had created the Federal Reserve Bank in 1913. Over time, the convenience of paper money gradually overcame the need for its exchangeability. The latter was assumed, but rarely put to the test in practice. The function of the paper currency, however, did not change. By virtue of its original exchangeability for a form of hard currency, paper currency came to be seen as the equivalent of the real thing -- silver and gold. The function of a paper dollar, however, was subtly different from the function of a silver dollar. The latter could be exchanged, but primarily for goods and services; a paper dollar could also be so exchanged, but its value in being so capable of exchange derived from the fact that any person holding it could at any time, with no questions asked, obtain its equivalent in actual silver coin. It is at this point that we come to a fundamental distinction about money, which must be drawn if we are to understand the faults of the current system. This distinction may be expressed as the difference between value and wealth. Properly speaking, wealth is everyone's goal: to acquire sufficient assets to have no worry for future needs or concerns. Superficially, and commonly, we are used to measuring wealth in units of money. That is only a convention, however, which allows all of the complicated mix of a typical person's collection of assets to be valued in terms of a single unit of value, the dollar. The assets are each converted to dollar values (through appraisals, or index look-ups, or whatever means is appropriate), and the total of the individual values represents the measure of that individual's wealth, expressed in dollars. Wealth, properly understood, does not consist of dollars. Dollars are the measure of one's wealth. And the measure the dollar makes at any one point in time depends on the dollar's relative value with respect to other commodities, currencies, and exchangeable assets. If government inflates the supply of dollars in a given economy, prices will go up, because there are more dollars seeking to be exchanged for real goods and services. Someone who holds only dollars as assets will be made poorer by inflation: his dollars will buy less and less at the store. So that is why dollars can never be regarded as wealth. And the distinction is crucial if we are to understand what our current "money" is, and what function it serves. Strictly speaking, money is a means of exchange. If you are starving on a desert island, with a trunk full of pirates' gold, you may have lots of money, but it is worthless to you in that situation. You cannot eat it, or use it to stay alive in any fashion. Its value comes solely from your ability to exchange it for something else which you value more, namely, food and water. As we all know, the value of the latter can increase greatly in times of famine and shortage, and require us to exchange much more in money to obtain them than we might in more normal circumstances. Money -- in whatever form -- is therefore useful only insofar as it will (a) retain enough value so that we can exchange it for what we need in any given situation; and (b) -- what comes to the same thing -- resist or hinder any attempt to depreciate it. Money has taken all kinds of forms over time, depending on the environment in which it is used. People have used shells, rocks, beads, and all kinds of other objects which had the properties of being (a) relatively scarce to begin with, and (b) difficult to acquire or augment. In a sort of Darwinian survival of the fittest, the development of money has been an evolutionary process, with the most convenient and durable forms winning out over all the others. The process continues apace, so that what was convenient twenty or thirty years ago is continually being replaced by something that serves the purposes of money better today. And this continued evolution has tended, in our society, first to favor paper dollars over gold and silver ones, and more recently, electronic and digital dollars over paper ones. These new forms of paper currency were no longer "certificates", but "notes." And a note is a promise to pay. But -- pay what? When I look at the picture of the Federal Reserve note just reproduced, what is it a note for? What will I get if I "collect" on the note? As I said, you will no longer get an equivalent amount of silver. Your Federal Reserve note is officially exchangeable only for another one of like kind. A note is replaced with another note -- and so it remains perpetually a promise to pay. When you pay for some goods in cash, you pass those promises to pay on to the seller of the goods, who accepts them so that he or she may pass them on to another in turn. Welcome to the world of fiat currency, where currency ("legal tender for all debts, public and private", as is printed on each note) is whatever the Government by law says it is -- in this case, Federal Reserve notes. Notice that fiat currency divorces the value of money from its medium. Gold and silver coins maintained their value, because they could always be melted and sold as the metal itself. There is no inherent value to speak of, however, in the paper on which our currency is printed. We ascribe whatever value paper money has to what it can buy us in goods and services, and not to the medium in which it is embodied. In this post, we have contrasted the difference between coined money and paper money, or fiat currency. In the next post, we will look at the difference between paper money and electronic money. Then we will finally be in a position to understand just what money is. And that knowledge will help us see what is so wrong with our current monetary system. In November 2009, I put up this analysis of where I could then see things were going, and the reasons why no one should be happy about it. Since that time, I have continued to monitor the trends as best as I am able -- but at the same time, I have delved far deeper into the economics of our current monetary system. Do you see how the deficits, both the current one and those future ones projected by the Obama administration, will dwarf all prior deficits run up in earlier years? If you can see that, then ask yourself the question: what has changed in our current circumstances since 2008 which would allow this country to entertain the idea of borrowing even more than we borrowed in the past? Is the economic outlook truly that rosy? If you agree that our circumstances have not so improved in the last two years, then we are on the same page. Nothing -- and I mean nothing -- could ever justify the current level of deficit spending, if the purpose were to keep this country sound and intact. The truth is again very plain: the current level of debt is accumulating at a rate which future generations will never be able to pay back. Since researching and writing my earlier post, I have tried to examine the roots of the problem. What is it about our current monetary system that would even make a politician think for a moment that spending behavior such as we have been witnessing would ever be sustainable for a multi-year term? My conclusion, after careful investigation, is not reassuring: there is a double whammy at work. On the one hand, Barack Obama and those who support him, and who implement his spending policies, are simply engaged in a race against the clock. They are betting, as in the Pigford scandal, or the much larger universal health care scam, that they can fool enough of the electorate into thinking by the fall of 2012 that their continued access to federal largess will depend on their voting to re-elect the President. And they are counting on the system having enough resilience not to go down before those elections in November 2012. The second factor is being supplied independently, by the Federal Reserve under its chairman, Ben Bernanke. He has convinced his Board that the Fed must intervene massively in the current economy to avoid a repeat of the mistakes made by the Fed in the 1930's. (He has not convinced everyone on his Board -- read this article for a link to a truly disturbing dissent by the president of the Dallas Fed.) With its bottomless checkbook, the Fed has bought trillions of toxic assets from banks and other firms, in an effort to stop up the holes in their balance sheets. The individual prices paid for these assets, and their current value on the Fed's books, remain swathed in secrecy -- only aggregate figures are published. 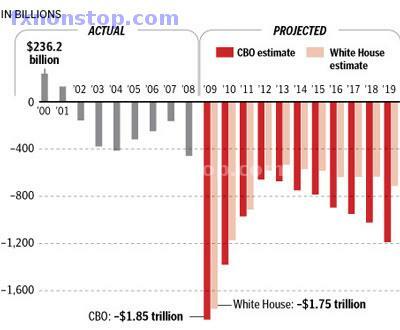 The fact remains, however, that the Fed has flooded the system with trillions of dollars in addition to the deficit spending by the Obama administration -- again, in an attempt to forestall imminent financial collapse. Such a race against the clock is an unconscionable gamble. It may succeed until 2012, but in the longer term, it cannot be maintained. The world will not continue for long to accept debt denominated in dollars, when those dollars by sheer multiplication become meaningless. The signals are already plain that other countries are ready to move on, and to replace the dollar with some other form of reserve currency. And when that happens, those holding dollars will be left in the lurch. Like a third-world currency, whose politicians simply printed more and more in a vain effort to stave off economic collapse, and who were incapable of changing their ways as the situation required, the dollar -- and those who depended on it -- will become a relic of the past. There is so much that is wrong with our current system that it is difficult to know where just to begin, in order to make the problems understandable and to lay the foundation for a sensible path out of the predicament. But the whole scenario is so crucial that the effort must be made. In upcoming posts, therefore, I will lay out just what is wrong with our current monetary system, why we persevere in making the same blunders over and over again, and the only way which I think offers some hope for a desirable future. Stay tuned, because we are going to go deep into what lies behind the current system. Only with that understanding can we see where we have gone so wrong, and hope to thread our way out of the labyrinth. President Barack Obama has carried government by fiat to a new extreme. At the most recent count, he has appointed at least 39 czars to positions of executive authority over all aspects of Americans' (and foreigners') lives, without any check by Congress. And lest you think this was a one-time phenomenon, there is indisputable evidence of a trend: there were just 32 czars as of July 2009. The problem is this: for fiat money to work as a medium of exchange, money must represent ultimately a valid promise to pay. "Fiat money" is the ultimate exercise of government's prerogative: "And Government said: 'Let there be money printed on paper', and lo: there was money printed on paper, without any backing in gold or other commodities, and Government saw that it was good." When you accept a dollar in exchange for your work, or goods, you expect that dollar to be fully exchangeable when you tender it to someone else for goods or services. And to be sure, the Government helps out, by legislating that all paper money it issues "is legal tender for all debts, public and private." (Check any paper bill you happen to have in your wallet.) So when someone offers you paper dollars in payment of his debt to you, the Government regards it as a legal extinguishment of his debt: the paper dollars are, in other words, a valid exchange for his earlier promise to pay you the sum he agreed he owed you. If the government elects to follow the path recommended by that financial genius I citied earlier, then there will come a time when the rest of the world says: "The party's over, my friend. No more paper dollars: we refuse to accept them for what you owe. You will have to start paying your debts in gold, or Swiss francs, or some other reliable currency. And guess what: until you rein in your current spending spree, and unlimited printing of paper dollars, you won't be able to buy any gold, or francs, or any other reliable currency, because no one wants your worthless 'money.'" The Obama administration is embarked on a course from which there is no honorable return. Although publicly confessing that "we are out of money", President Obama shows no sign of walking the walk that he talks. He has taken more vacations in the first two years of his term than any prior president, at a total expense which can never be known, because the executive branch does not provide an easy target: it divides its budget into at least 12 different categories, so that no one critic can cite the actual total it spends. But never fear -- the authorities who keep vigil over the country's borders are ever on the watch to keep out those who would try to freeload on our generosity. For an example, please read this story of the vigilance on the part of our immigration officials, who barred a nine-year-old English boy from visiting Disneyworld with his grandparents. Because the grandparents were from South Africa, and they had obtained only a South African passport for their grandchild, who was born and raised in England, the "Government" in its wisdom denied the boy a visa to come to America and visit Disneyworld, because, don't you see, "there was a risk he would not leave the U.S. at the end of his holiday." Indeed, it is that very fact that clinches it for me. Of all the 39 czars the President has seen fit to appoint, in a deliberate end run around Congress, no one -- not President Obama, not Congress, nor anyone else in "Government" -- has called for the administration to appoint an ombudsman. "We are of Obama, and hence we can do no wrong." Q. E. D. President Obama's administration cares only about power, and not mistakes. Welcome to America, Micah -- that is, in theory. You can surely experience all you need to of Disneyworld on YouTube, and then we won't have to worry that you might become a financial burden on us, as our President has turned out to be. One spendthrift, after all, is enough. The Supreme Court of Georgia announced in an order yesterday that it had accepted the petition of Christ Church in Savannah to review the adverse decision last summer by the Georgia Court of Appeals. That decision was followed by a seemingly inconsistent one in favor of a withdrawing church in another case, as I noted in this post. Because of the different standards applied by two different panels of the Court of Appeals, there appears to be uncertain law in Georgia with regard to the continued validity of implied trusts for religious purposes, and review by the Supreme Court should establish some uniformity. Christ Church Savannah has published a statement on its Website with more details and quotations; there is also an article based on an interview with Christ Church's pastor here. The case should be briefed by late spring, with oral arguments probably in the fall or winter. A final decision might not issue until next year. This is good news for Christ Church Savannah, as the highest courts of a State accept cases for review only when they want to change or modify the result below, and lay down the law for other State courts to follow in doing so. For ECUSA and the Diocese of Georgia, of course, it means more and more dollars laid out in defense of that Trojan horse, the Dennis Canon. Almost 21 months to the day after the initial suit was filed, today the parties have presented the court with their arguments and claims to the property of the Episcopal Diocese of Fort Worth and its Corporation. In a two-hour hearing of the 141st District Court, Judge John Chupp said the case came down to the two essential questions that he had asked at the first hearing, in September 2009: Did the Diocese have the right to vote and leave The Episcopal Church (TEC)? and, What do the property deeds say about ownership? Throughout the morning, the judge's questions and comments to the attorneys for both sides continued to probe those questions. Representatives for the Diocese, Corporation, and the intervening parishes warned the judge that “other states have some crazy statutes,” but that Texas law does not permit a trust to be imposed on another person's property without written consent, that no trust is irrevocable unless that is expressly stated, and that non-profit corporations, such as the one that holds the property of the Diocese, are entitled to select their own officers without having them removed at the whim of others. To rule in favor of the plaintiffs, therefore, would be to “declare Texas trust law unconstitutional” and throw into question the legal status of virtually every church property in the state. Present in the court room was David Booth Beers, counsel to TEC's Presiding Bishop, who had threatened diocesan leaders with discipline as early as 2006. Also present were over 100 clergy and lay people of the Diocese, ready to testify if called upon. However, the issue they came to address – a legal challenge to the authority of the Diocese's counsel – was not heard. Though the plaintiffs' counsel initiated the charge, upon gathering in the court room, they asked for its deferral. The judge expressed his concern for those who had traveled considerable distance and taken time to be present. Bishop Iker thanks the legal team for their hard work preparing and presenting our case. He extends his gratitude to those who were present at the hearing, and to all those who undertook a time of prayer and fasting. Please continue to pray for wisdom for Judge Chupp as he weighs the arguments before him. A ruling is not expected before next week, at the earliest. The good judge appears to have penetrated ECUSA's fog of black ink, and gotten to the heart of the matter. Those indeed are the questions at stake: "Did the Diocese have the right to vote and leave The Episcopal Church (TEC)? and, What do the property deeds say about ownership?" If he keeps his focus on the evidence offered pro and con on both those issues, he should reach the right decision. Oh, and note ECUSA's new mantra on why its Constitution is silent on the ability of dioceses to withdraw their affiliation to the denomination: it is not because any provision attempting to restrict that right would violate the First Amendment's right of association, but the language is absent because such an act is "inconceivable." No doubt; certain minds at ECUSA find it inconceivable that a diocese might not want to play the game by their "rules", which are bent, broken and trampled at will. From the point of view of Judge John Chupp, who will hear arguments on the opposing parties' motions for partial summary judgment next Friday in the case originally brought by ECUSA and Bishop Gulick against Bishop Iker and his fellow trustees, it must seem as though the parties are leagues apart in their analyses of the case. ECUSA rests on Texas law as it was a hundred years ago. Bishop Iker's attorneys, assisted by former Texas Supreme Court Justice Scott Brister, show an entirely different landscape of "neutral principles" in current Texas law. There is a very good reason for this: for ECUSA, the law reached its pinnacle in the 1871 United States Supreme Court case of Watson v. Jones, which recognized a category of so-called "hierarchical" churches, governed by "highest judicatories" to whose final decisions on any religious dispute the civil courts were required to defer. (Among other names this approach has received, it is called "the doctrine of deference.") In 1909, the Texas Supreme Court followed Watson in the case of Brown v. Clark, 102 Tex. 323, 116 S.W. 360, when it recognized that a local Presbyterian church in Jefferson, Texas had merged with its parent into a combined larger Presbyterian Church, and awarded its adherents possession of the church property as against local dissidents who were opposed to the merger on doctrinal grounds. In 1979, however, the United States Supreme Court announced an alternative to the deference doctrine. That year it reversed the Supreme Court of Georgia in Jones v. Wolf, and held that States were free to decide religious property disputes on "neutral principles of law." (For more background to the legal history, please see first this post, and then this one.) Under this latter approach, courts look first to how churches hold title to their property by examining their deeds, their articles, by-laws and national governing documents. Only if the latter lay down a scheme of title to property to which all lower churches are contractually bound in some legally cognizable form do the courts look past the bare names on the record title. Notwithstanding the First Amendment's proscription, courts do have jurisdiction to review matters involving civil, contract, or property rights even though they stem from a church controversy. Neutral principles of law must be applied to decide such matters . . . The same court reiterated its adherence to a "neutral principles" approach in another dictum delivered in a 2006 case. Other recent decisions by Texas courts have held the same thing: see footnote 2 on page 2 of Bishop Iker's response to ECUSA's motion for citations. Although the Texas Supreme Court has not had the occasion to decide any church property disputes since the 1979 opinion in Jones v. Wolf sanctioning such an approach, it did indicate in a 2007 decision (where it devoted a whole section of its opinion to what it called the "Neutral Principles Exception"), its assumption that such an approach would now be applicable to such disputes. In light of these developments in the law since 1909, and especially in light of those 1999 and 2006 cases from the Second District Court of Appeals, one can only wonder at a brief in support of ECUSA's motion for partial summary judgment which does not cite or discuss any of these recent Texas cases, and which steadfastly maintains that Texas courts still adhere to the law as it was declared in 1909. There are even greater anomalies in the brief filed (at presumably considerable expense) by ECUSA. In its table of cases cited, it lists the landmark decision of the United States Supreme Court in Jones v. Wolf, which held that states could, in resolving church property disputes, adopt the neutral principles approach in lieu of the deference approach. As would be fully appropriate, the index to the cases (page v) uses the expression "passim" in lieu of giving the precise page references on which the case is cited in the 62-page brief. Lawyers use "passim" as a shorthand for: "there are too many references to this case to list individually; it is cited throughout the brief, on nearly every page." The most striking thing about TEC's motion is that it never mentions "neutral principles of law" - not once. . . . The question for decision is whether civil courts, consistent with the First and Fourteenth Amendments to the Constitution, may resolve the dispute on the basis of "neutral principles of law," or whether they must defer to the resolution of an authoritative tribunal of the hierarchical church. ... We therefore hold that a State is constitutionally entitled to adopt neutral principles of law as a means of adjudicating a church property dispute. ECUSA does deign to discuss "neutral principles" in its reply, but only to argue that in Texas the courts prefer to follow an "identity" approach, which is nothing more than a new name for the old "doctrine of deference," since it purportedly "requires the court to identify the faction that is loyal to the hierarchical church [by not questioning the decision of the church on that issue]." So once again, ECUSA takes a bye on confronting the actual case law it will have to argue to the Court of Appeals, and argues the cases it feels are most supportive of its position. Such evasion, and "flight to the familiar", is always a dangerous litigation strategy. Courts do not appreciate litigants who repeatedly dodge the very question that is before them. In their reply, the "Local Episcopal Parties" rely very heavily on the recent decision of a trial court in El Paso, which makes a point of following the "identity" approach. Judge Chupp in Fort Worth, however, is not concerned with what other judges in El Paso think the law may be. He knows that any decision he renders will go to the Fort Worth Court of Appeals, which has twice since 1999 referred to "neutral principles" as the basis for resolving church property disputes. He must, accordingly, have a healthy distrust of those who would try to seduce him down other paths. ECUSA makes two other arguments in support of partial summary judgment. It contends that the Dennis Canon overrides Texas law -- again, because Texas courts must "defer" to a hierarchical church, which is given free reign to impose a trust in its favor on property it does not own. Unlike California and New York, however, where this argument succeeded because there were statutes which could be read as legitimating the trust declared by the Dennis Canon, ECUSA can point to no Texas statute which allows a beneficiary to declare unilaterally that someone else's property is held in trust for him, the beneficiary. To the contrary: Texas law, like South Carolina's, is based on the Statute of Frauds, which since the seventeenth century has stated that only the absolute owner of real property may place it into a trust, and only by signing a written deed to that effect. And in making its argument, ECUSA skates right past the most crucial point of all, which is that there is no language in the Dennis Canon imposing any trust on the property of a Diocese. This is high-priced gobbledygook, to be sure, but it is still gobbledygook, and circular reasoning, to boot. ECUSA fails to engage Bishop Iker on the merits. It acts like a ship passing in the night, with no obligation to acknowledge the vessel that opposes it. It has its formula for winning cases in other state courts, and it is sticking to it -- regardless of what the law of Texas says. This Friday, or shortly thereafter, we will see whether that formula makes any headway with Judge Chupp. Bishop Jack L. Iker and his attorneys yesterday filed responses to the motions for partial summary judgment brought by ECUSA and the "Local Episcopal Parties" (which is how Bishop Ohl and his group are styling themselves in court), and which are due to be heard on January 14 by Judge Chupp, as discussed in this post. The opposition papers are very well written, and make telling points against ECUSA's arguments. I shall quote from them extensively in subsequent posts. ECUSA and the Local Episcopal Parties also filed their opposition papers to the motion for partial summary judgment brought by Bishop Iker, his Diocese, its Corporation, the Trustees, and Standing Committee, and the intervening congregations of the Diocese. Again, I shall have more to say about their opposition in subsequent posts. What I wish to call your attention to in this post is something that had completely escaped me in previous visits to the multifarious litigation occurring in Fort Worth. One of the attorneys for Bishop Ohl and the Local Episcopal Parties, Jonathan Nelson (he argued at the initial hearings in front of Judge Chupp), who is now on his own, was earlier in a law partnership in Fort Worth called Broude, Nelson & Harrington, P.C. As a member of that law firm, he represented the Corporation of the Diocese of Fort Worth in a 1993 lawsuit against the Rev. M. L. McCauley, of the Church of the Holy Apostles, who had voted with his vestry to leave the Diocese and join the Antiochian Orthodox Church. Bishop Iker was then the Co-Adjutor of the Episcopal Diocese of Fort Worth, scheduled in 1994 to succeed the Rt. Rev. Clarence C. Pope, Jr., who as the diocesan was also the head of the associated Corporation. That Corporation, in turn, was established to hold legal title to the real property of all the parishes in the Diocese -- including the Church of the Holy Apostles. Thus when the Rev. McCauley and his vestry claimed the right to continue to occupy the parish's property after they had joined the Orthodox Church, the Corporation of the Diocese had to become the plaintiff in a lawsuit filed to oust them from possession. The attorney who participated in drafting the complaint and supporting affidavits for the plaintiff Corporation, and who signed his name to the pleadings, was Jonathan Nelson, of Broude, Nelson & Harrington, P.C., Fort Worth, Texas. Now that same Jonathan Nelson is representing the minority who, with their provisional bishop, has brought suit against Bishop Iker and the other trustees of the diocesan Corporation. And he has the gall to offer, on behalf of his current clients, the very pleadings and affidavits which he mainly drafted in the 1993 lawsuit as ostensible "judicial admissions" on the part of his former clients. When Iker and his faction were still part of the Episcopal Diocese of Fort Worth, they were successful in recovering The Church of the Holy Apostles for The Episcopal Church and the Diocese from that earlier breakaway faction.59 The positions Iker and his followers took in those affidavits in the Holy Apostles case have the power of judicial estoppel. I have added the bold emphasis to highlight what I consider to be extraordinary statements made by Mr. Nelson on behalf of his current clients. He first claims that Bishop Iker (who succeeded Bishop Pope during the lawsuit) recovered the possession of the property of the Church of the Holy Apostles "for The Episcopal Church and the Diocese . . .". But the lawsuit which Mr. Nelson filed for the diocesan Corporation was solely in its name -- the "Episcopal Church" as such was not ever a party to the lawsuit. You can view the actual petition filed in the name of the Corporation, and in the name of the remnant parish, beginning at page 6 of this exhibit. Mr. Nelson never purported to sue on behalf of "The Episcopal Church" at the time, and so his claim to have done so, made now in a context that is wholly adverse to his former client, is a blatant betrayal of that client's trust and confidence. a. each parish consists of members of The Episcopal Church confirmed in or transferred to that parish, who are in communion with the Bishop and the parish being in union with the diocesan convention . . . The only argument in this motion that is not in TEC's motion is an assertion that Defendants are bound by previous admissions that TEC is hierarchical. This argument takes a lot of nerve, as it is based on documents drafted by Plaintiffs' counsel back when he was counsel for the Defendants. This is an unsavory attempt by an attorney to use words he drafted for a client against that very same client and in favor of a new one. Plaintiffs' counsel Jonathan Nelson represented the Corporation, the Diocese, Bishop Iker, and their representatives in the Holy Apostles litigation) As he stated in his closing letter to Bishop Iker, "It has been a privilege and a pleasure to represent both you and the church in this matter ." He drafted the pleadings in that case, and wrote a memo advising Bishop Iker and other affiants what they needed say. As the Second Court of Appeals unequivocally found, he no longer represents the Diocese or Corporation. Having been paid to draft documents for them, he now attempts to use his own words against those he used to represent. Texas Disciplinary Rule 1.05(b)(3) provides that "a lawyer shall not knowingly: ... [u]se confidential information of a former client to the disadvantage of the former client after the representation is concluded unless the former client consents after consultation or the confidential information has become generally known." "Confidential information" is not limited to privileged information, but includes" all information relating to a client or furnished by the client." And "generally known" requires actual knowledge of the facts in question. The Diocese and Corporation object to such a blatant misuse of the information they paid Mr. Nelson to prepare, and ask the Court to strike it from the record. I believe I can anticipate Mr. Nelson's response -- something along these lines: "Yes, I represented the Diocesan Corporation, and I still am representing that same Corporation today. It's just that Bishop Iker has usurped it for the time being, and so I have to prevail here before I can truly represent it." It will be very interesting to see how that defense goes down with Judge Chupp next Friday. • a pleading that the Corporation owns legal title and the parish owns beneficial title to Diocese property - with no mention of TEC owning anything. This kind of lawyering gives the profession a bad name. The Court should sustain the objection to this evidence. • an ordination oath promising "to conform to the Doctrine, Discipline, and Worship of the Episcopal Church" does not say anything about granting authority to TEC to take away all the affiant's property. None of these statements shows that the Diocese ever thought TEC was the ultimate authority on property ownership. It is undisputed that the Diocese claimed just the opposite in its very first Constitution. These" admissions" show only that the Diocese is hierarchical at the diocese level, which is consistent with the name "Episcopal" and TEC's own Constitution and Canons. Local TEC argues that because TEC is hierarchical at some level, it must be completely hierarchical all the way to the top. But there is no law that says churches must be 100% hierarchical or 100% congregational; such a law would surely violate the First Amendment's Free Exercise clause. Texas courts recognize that "[t]he terms hierarchical and congregational are poles on a continuum along which church organizations fall." Legally and historically, TEC is hierarchical from the diocese down, but not from the diocese up. That is all these so-called admissions say, and they are as true today as they were before. There is much, much more: the memoranda and the accompanying exhibits -- including two affidavits from Dr. Jeremy Bonner, of Pittsburgh, which completely refute those of ECUSA's expert, Prof. Mullen -- are all worthy of your attention. In subsequent posts leading up to Friday's hearing, I shall be highlighting the principal arguments. Fasten your seatbelts -- this is going to be quite a ride!